April 8th – 10th 2020 – Join us at Disneyland Paris! We hope that you can join us at Disneyland Paris between April 8th – 10th 2020, for 3 days and 2 nights, to experience the magic of Disney! The cost of this event is listed below and is a tiered pricing structure based on people sharing a room. This ensures it is easier for us to accommodate a room and that you can also take advantage of the best pricing possible for the package that has been created. This event is out of term time for the majority of schools in the surrounding areas but please do check with your school’s calendar (if applicable), prior to booking. Friday April 3rd is the end of Spring Term date that we have been working with as a guideline and we will be back in time for Easter weekend! 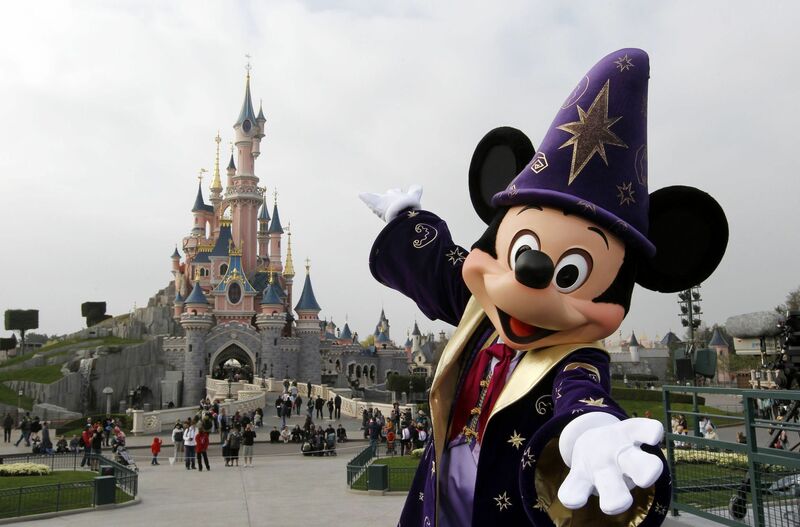 There are two parks for you to enjoy at Disneyland Paris, the Walt Disney Studios Park and the Disneyland Park. There are maps of both of these locations available to access further down the page. For further information on the Disney Priority & Easy Access Passes please see our Disney FAQ further down the page, where this is explained for you. In regard to this event, we cannot emphasise enough, the need to PLEASE READ ALL NOTES pertaining to this trip, our DISNEY Q&A and ensuring that you understand all costs, before requesting places. Any errors that are made can affect your booking and the cost of it. 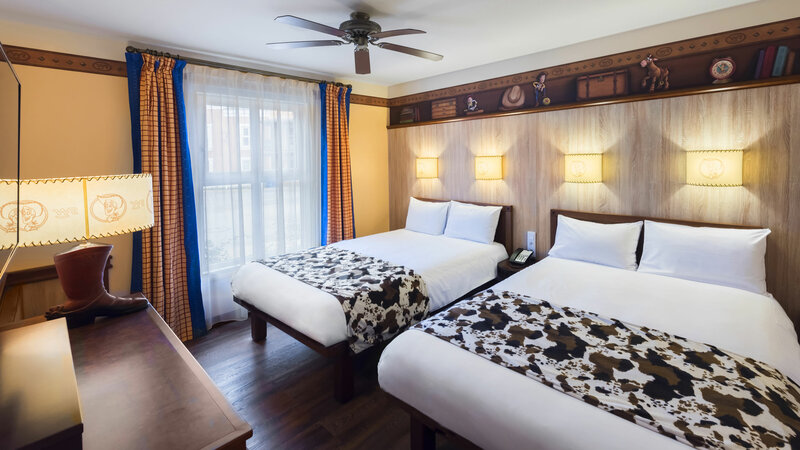 For the duration of our stay we will be at the Hotel Cheyenne, a Wild West themed location with a little Toy Story influence. With a large travelling party, the Hotel Cheyenne gives us the biggest flexibility in regards to room / bed layouts. Each room includes a bathroom with bath, hairdryer, safety deposit box, TV with the Disney Channel and International channels as well as Wi-Fi. Please note that a room at the Hotel Cheyenne, is designed as either two double beds or a double bed, single bed and pull out single bed by default. One cot may also be in the room. A room cannot exceed 4 persons and one cot. Where your family is larger than this, Disney provide two adjoining rooms and open the door between them to provide you with the space that you need. There are no exceptions to this format. In terms of dining, breakfast will be taken within the Hotel itself and multiple options exist for you to choose from for your evening meal. We will work closely on dining arrangements with you approximately 90 days prior to the visit. On one day of the visit we will also be joined for breakfast by one of the main Disney Characters where you are able to take photos and grab an autograph. We of course recognise that every family is different in terms of their needs and the time they allocate to different tasks and breaks, but in the majority for the short stay that we have, most of your time will be spent in the Disney parks as opposed to at the hotel as a rule of thumb. Please remember that a room cannot exceed 4 persons and a cot. For larger parties than this an adjoining room is required. All children in a room must have an adult sharing with them. Should your requested places for the event be confirmed back to you, you will then be invoiced by us for 15% of your booking as a deposit. This is non-refundable and due no later than April 30th 2019. The balance of your booking is then required to be paid in full by no later than February 1st 2020, this is also non refundable. You are able to pay your balance as you wish, either in instalments if easier for you or as a lump sum as you prefer. Please note that missing either the deposit cut off date or balance date deadlines will result in the cancellation of your booking at Disney. For your further reassurance Spectrum have a dedicated client account with Barclays for such events to ensure the protection of your payments with larger trips. The event at present is based up a single standard 57 seater coach and a second 47 seater coach with wheelchair ramp being taken to the venue, these are provided by Mil-Ken, our travel partner. Both coaches have onboard toilets. Both coaches will be departing from the east of Cambridge unless comprehensive demand for places warranted an alternate collection point as well. The coaches and drivers will be staying out at the venue with us for the duration of the visit and staying in the same location. April 8th – Depart Cambridge @ 1230am for Dover to Calais P&O ferry crossing with Mil-ken via coach. The duration to Dover is circa 2.5hrs followed by an approx 1.5hr crossing. This is followed by circa 3.5hrs to Disneyland Paris. April 10th – Depart Disneyland Paris for return to Cambridge. Departure time to be confirmed but estimated around tea time. As with all our coach events, should your child normally travel by booster seat, car seat and so forth then they will need to travel the same way via coach. This is without exception and in line with safety and insurances. Provisional arrangements are in place with our departure point to leave your cars there for the duration of the trip and we will advise to the confirmation of this, or any changes to it. We are course aware and conscious of the Brexit proceedings going on at present. Throughout the course of the coming months we will continue to work closely with those involved and make you aware of any travel changes that we decide to make, or to the timings of them. These are purely estimated as best endeavours at this point in time. Whilst we are fortunate to have a good amount of space under the coaches for our trip, please do ensure that you are reasonable with the luggage that you bring in the interests of everyone attending. We also need to consider wheelchairs and pushchairs as part of the available storage space. We have put together an FAQ to provide you with as much information as possible prior to making your booking. This covers areas either not touched on in the above notes or only slightly referenced. Please ensure that you have read all the notes and answers provided. How does this package differ from the initial budgetary pricing that was presented? We initially provided an approximate budgetary figure of £350 per person (regardless of age) based on a 3 day stay at the Santa Fe hotel to ascertain interest. Following the feedback from that data gathering and considering all eventualities we have provided a final package that includes the following changes. We have looked at countless options to say the least for this event, via Disney, our agents and via independents and the Internet and are extremely happy with the pricing and coverage for the package we have put in place. We did consider adding on a further 1 day stay to make it 4 days in total at the venue but the data showed us that this was potentially quite viable for family units of 4 persons or under but pricing escalated quickly for those with 5 persons or above, due to the adjoining room requirement. Does the whole family need to have a passport before they request places? No, you don’t, but everyone under your booking will of course require one before they travel. For anyone with an existing passport, they need to ensure that they have at least 6 months remaining on their passport from the date that we travel back under current guidance. Are we allowed to include friends and extended family in our place requests? For this event we expect a high demand for the available spaces and priority will always be given to the children and families that we support in the first instance. Should there be any available space once all booking requests have been processed, then this is something we can consider at that point. 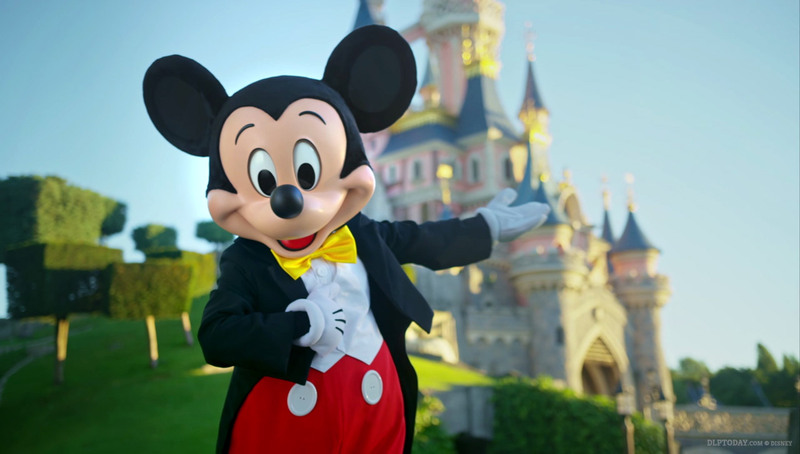 Are there Priority Pass options at Disneyland Paris to assist those with disabilities? In the first instance Spectrum will work with Disney to organise the relevant passes for the travelling party via the information that we hold. Please note however that Disney reserves the right to ask for additional or supporting information in regarding to issuing the relevant pass and we will assist you with this. Disney also reserves the right to reject pass requests even when supporting information has been provided. For any priority pass that is issued, it covers up to 4 helpers for that individual, of which at least one must be 15 years or older and able bodied. Typical examples of supporting information are DLA confirmation, PIP confirmation, GP’s letter and Blue Badge to name but a few. We will work through this with you, well in advance as its requested. This is all organised via Spectrum and not something that you need to do yourselves unless we advise to do so for a specific reason. How far is the Hotel Cheyenne from the main park areas? The Hotel Cheyenne is on average a 15-20 minute walk to the main Disney Parks at Disneyland Paris. A shuttle service is available though if you don’t wish to walk in, these leave every 12 minutes and run 7 days a week between 06.30 and 23.00. Will Brexit have an impact on the event? At the present moment in time there are many unknowns in regard to Brexit across all levels in the UK. It is also not unreasonable to assume that this could have an effect on such things as travel, time allowances and passport criteria in some shape or form. Throughout the coming months we will of course be checking in on and being updated to such matters that could impact our visit, travel or costs. Yes, you do. You need to ensure that all persons in your party are covered with appropriate insurance for the trip. This can easily be done via your local post office, sometimes your bank, as well as standard insurance option routes. Is it possible to stay at alternative accommodation to the Cheyenne Hotel on this package? No, it isn’t. For the purposes of this trip and for managing the logistics of the travelling party, all provided spaces will be based around the same accommodation and travel. Is travelling by Ferry better than the EuroTunnel? We have looked at all travel options in some depth and opted to travel via ferry to France with P&O (Dover to Calais) instead of via the EuroTunnel. The crossing is only 1 hr 30 mins compared to the Euro Tunnel which is 45 mins but this does gives those travelling with us the chance to stretch their legs properly in better space, use toilets far easier and get something to eat before the onward journey. At the present moment in time our exact travel times are predicted and more accuracy will be known around October / November. Throughout the year we are of course in constant contact with those we work with and will update you accordingly. This includes taking on board any changes relative to Brexit. What time does the Park open each day? 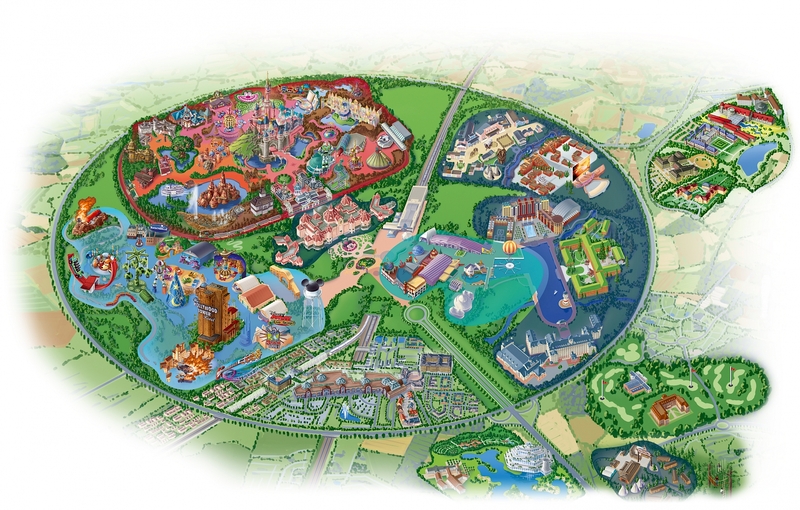 There are two parks within Disneyland Paris, the Disneyland Park and Walt Disney Studios Park. 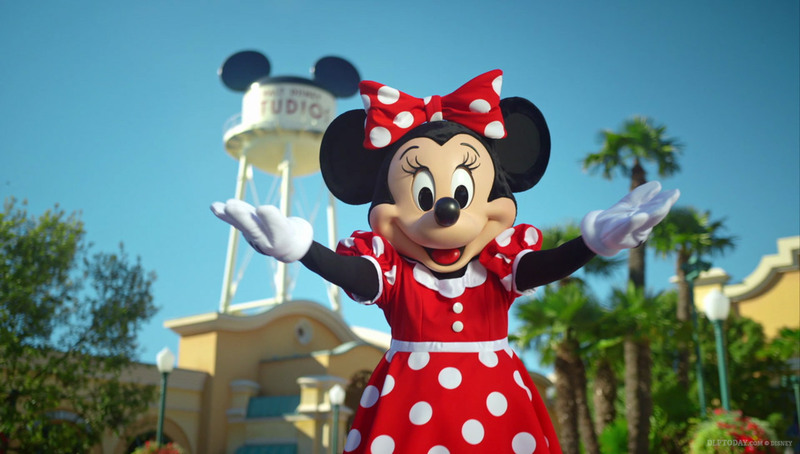 As a staying guest at one of the Disney hotels you can access both parks from 830am to 930pm. The general public visiting the site for the day are able to access the park from 10am to 730pm, therefore giving quieter times at the beginning and end of the day for all of those staying in the Disney hotels. What time can we check in? What time do we need to check out? We are able to check in from 9am on the day of arrival and access the park. You are able access your rooms from 3pm. For checkout, you need to be out of your rooms by 11am on the day of departure. We will confirm the departure time from the hotel in due course but you are still free to access the park until we leave. The Hotel Cheyenne has secure facilities in place to ensure luggage can be kept safe prior to room access and also for storage after check out and before the coach departs. How does the Halfboard Dining work? The dining package that is included for you is Halfboard Plus. This provides you with breakfast everyday at the hotel and a choice of options for your dinner. We will be working with Disney and you all nearer the time (around 90 days out) to arrange this options for you. We will also provide you with the details and timing of our Character themed breakfast during the stay. The only food that you need to cater for on your visit is anything that you require outside of these times, like lunch, drinks in the park and any snacks etc. Will there be breaks during the travel? Yes, there will be. We will be working in breaks as we go, both sides of the crossing as much as we can, given the duration. We obviously have to bear traffic in mind and meeting relevant points on time but around this we will accommodate as much as we possibly can. There is a toilet on board the coach and it will be totally to eat and drink enroute. This is also one of the reasons that we have opted to use a ferry crossing instead of the EuroTunnel. Will Spectrum have volunteers there to assist us? Yes, there will be members of the Spectrum team at the event. We are there to assist you with any issues we are in control of and general guidance. Should there be any issues pertaining to rooms and meals etc, then the Disney Hotel and Resort Team are of course on hand to cover all of this. As with all Spectrum events and trips, we always assist as much as we can but the care of the children attending will always be the primary focus of the parents and carers that assist them. What currency do I need in France? If you have never travelled to France before, the currency they use is the Euro. You can easily exchange your money in to Euro’s at such places as Post Offices, your Bank, some Tesco branches and travel agents to name but a few. We recommend keeping an eye on the currency exchange leading up to departure and start looking at organising your Euros in the week or so ahead of the visit. Ensure that you leave enough time to do this with your preferred exchange. Due to the nature of the trip and stops etc both side of the crossing, ensure that you do still have some £ sterling that is accessible to you, should you need it. Will Spectrum send us reminders throughout the year on the event? A dedicated mailer will be in place for anyone that has places on the event, keeping you up to date, passing on tips and reminders and making sure that you have everything in place that is needed. Is there a Smartphone app for Disneyland Paris? Yes, there is. Disneyland Paris has a dedicated app for the venue which covers such areas as maps to explore the site, waiting times and show schedules to name but a few. The app is available on iPhone IOS or Android and can be found via the following links. Do you have any information on phone signal, data access and making calls home at Disneyland Paris? Disneyland Paris in the majority is covered by a mixture of 3G and 4G signal as well as Wi-Fi being spread across the resort and hotels. Should you need to access 3G and 4G signal for data at different times and whilst travelling, please remember that this is classed as data roaming as you have a UK based phone. The cost of data roaming is always coming down and most major UK mobile networks now offer a daily or weekly data package for use abroad, giving a fixed amount of data a day for a nominal upfront charge. You may even have a level of European Data roaming included in your existing package which just comes off your normal data allowance as it would at home (like O2 Europe Zone for example). In a lot of cases though, making calls from France will still count as an International call to back home. It is always best to check with your network provider before travelling and opt-in before you go. This will be one of the areas that we remind you about during the coming months to check off your list. This is a question that is exceptionally hard to answer as every family has different numbers of individuals in it, spending habits and budget available for such things. We recommend speaking to friends and family you know that have been before, that are perhaps similar to yourselves in some ways, to gain an understanding of what they spent as a guideline. In short the vast majority of spending you will incur is likely to be on snacks and drinks etc outside of set meal times that are included and purchases / memorabilia from the resort. Please ensure for accuracy, that you double check all information that you have entered before submitting your request for places to us. Do you currently receive DLA for any of the children listed above? Do you require wheelchair access and dedicated bay on the coach? Please ensure that you have read all the notes in regards to room rules and ages to ensure that you book accurately to match your request. All ages must be accurate for the time of travel. Please remember that an adult is defined as 12 years or older and no more than 4 persons plus one cot can be in a room. Please remember that a child is defined as 3-11 years and no more than 4 persons plus one cot can be in a room. Please remember that an infant is defined as up to 2 years and no more than 4 persons plus one cot can be in a room. Please use this notes area to clarify details where two adjoining rooms are required due to the size of your party and to make us aware of any additional information regarding your booking that relates to your room or will assist your booking with us. Based on the pricing per person provided, you confirm that you are able to pay your 15% non-refundable booking before April 30th 2019? Based on the pricing provided, you confirm that you are able to pay the balance of your booking by February 1st 2020? Yes, we understand that medical information may need to be provided for Disneyland Paris to issue a Priority Pass to any child with additional needs or disability in our party. We also acknowledge that this is provided purely at the discretion of Disney. I confirm that I have read all notes and the Disney Q&A provided by Spectrum, regarding this trip before requesting places. Please note that if you have booked to attend one of our events and come the time of that event, one of the people attending in your party has fallen ill, we are very sorry but due to the nature of the children that we support, it will not be possible for that person to attend the event with us. In line with the Health Protection Agency and similar to many local schools, it is not possible for us to accept a child at an event or session that has had sickness / diarrhoea until they have been clear of this for a minimum of 48 hours. We hope very much that you can understand our position on this and the caution that we must exercise.